This is a scalable context timeline. It contains events related to the event September 10, 2001: Alleged CIA Informant Warns Syrian Government about 9/11 Attacks; Syria Apparently Fails to Pass on Warning. You can narrow or broaden the context of this timeline by adjusting the zoom level. The lower the scale, the more relevant the items on average will be, while the higher the scale, the less relevant the items, on average, will be. Al-Qaeda operative Luai Sakra is reportedly arrested by Turkish intelligence in Turkey and then let go. It will later appear that Sakra was an informant for the CIA, Turkish intelligence, and Syrian intelligence before 9/11. He appears to have begun working for the CIA and Turkish intelligence in 2000 (see 2000). Sakra will later claim to have been arrested and quickly released twice by Turkish intelligence. It seems the first time was in 2000 and this was the second time. [Der Spiegel (Hamburg), 8/24/2005] It would make sense that he was released at this time if he was a secret informant for Turkey. It will later come to light that Sakra had some foreknowledge of the 9/11 attacks and warned Syrian intelligence about them one day before the attacks (see September 10, 2001). But it is not known if he used this arrest to warn Turkish intelligence and/or the CIA as well. The bombed Neve Shalom synagogue in Istanbul, Turkey. [Source: Murad Sezer / Associated Press]On November 15, 2003, two Jewish synagogues are struck by suicide truck bombs in Istanbul, Turkey. Five days later, the British HSBC Bank and British Consulate in Istanbul are hit by more truck bombs. 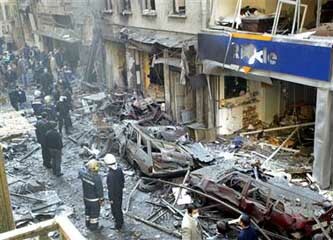 Fifty-eight people are killed in the attacks, including the British consul general, and over 750 are wounded. Turkish investigators believe the attacks were orchestrated by local al-Qaeda operatives after getting approval from Osama bin Laden. [BBC, 11/20/2003; BBC, 2/16/2007] In 2007, seven people will be sentenced to life in a Turkish prison for their role in the attacks. One of them is Luai Sakra, who confessed to being one of the two masterminds of the attacks (see March 21, 2006-February 16, 2007). Forty-one people receive shorter sentences, and 26 people are acquitted. [BBC, 2/16/2007] Evidence will later emerge suggesting that Sakra was an informant for the CIA, Turkey, and Syria at least in 2000 and 2001 (see 2000 and September 10, 2001). Luai Sakra detained in Turkey. [Source: Agence France-Presse]Al-Qaeda operative Luai Sakra is arrested in Turkey. He is found with false travel documents and $120,000 in cash. He had about one ton of explosives (hydrogen peroxide) stored in an apartment and fled when some of the explosives blew out the apartment’s windows. Arrested at a nearby airport, a number of passports are found revealing his true identity despite the fact that he had extensive plastic surgery. He soon confesses to planning to load the explosives onto speed boats and crash them into Israeli cruise ships docking in Turkish ports. The attack would have taken place in just a few days, possibly on August 5, 2005. [BBC, 8/13/2005; Der Spiegel (Hamburg), 8/15/2005; Der Spiegel (Hamburg), 8/24/2005; Washington Post, 2/20/2006] Apparently, Turkish intelligence had learned something about the planned attacks and warned the Israeli government. The Israeli government then issued a public warning, which seems to have tipped off the plotters, and Sakra is one of the few who gets caught. A Turkish security official complains that the Israeli warning may have “spoiled all the operation and all the militants might escape.” [Journal of Turkish Weekly, 8/15/2005] Sakra, who has been alleged to be an informant for the CIA, Syria, and Turkey (see 2000), will then reportedly make a remarkable series of confessions to Turkish interrogators (see Early August 2005). In December 1999, Alhazmi was taught how to use a computer flight simulator program while in an al-Qaeda training camp in Afghanistan (see Early December 1999). On April 4, 2000, Alhazmi took one day’s worth of flying lessons, and his instructor later claims he did quite well and was already almost capable of taking off and landing on his own (see April 4, 2000). One month later, he took a second one day flying lesson, however his instructor will later call him “dumb” and unskilled (see May 5 and 10, 2000). Near the end of 2000, he told two unconnected associates that he was in Arizona and learning to fly with Hanjour (see (December 2000-January 2001)). On March 19, 2001, he bought flight deck videos for Boeing 747s and a Boeing 777 (see November 5, 2000-June 20, 2001). On March 23, 2001, he bought an aeronautical chart covering the northeastern US (see March 23, 2001). In July 2001, he and Hanjour appear to have rented an aircraft together in New Jersey. Alhazmi’s credit card was used to pay for the aircraft rental, as well as fuel in Maryland (a072001haninawafflight). In 2002, al-Qaeda associate Ramzi bin al-Shibh will claim in an interview several months before his arrest that Alhazmi was one of the 9/11 pilots.